Greg Kroleski - Crazy enough to try it. Nerdy enough to chart it. I detailed my 2019 focus here (read that first if you want more context). Here is how I’m progressing. No progress yet except a few potential backcountry permits acquired. This habit has started out strong. 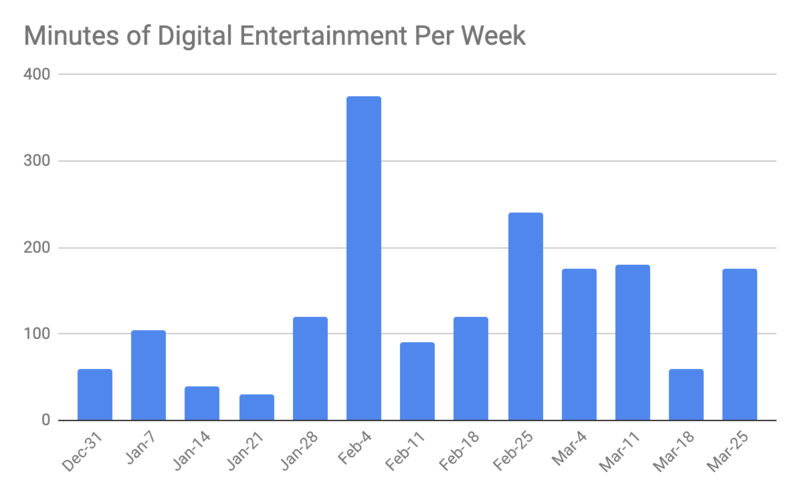 I stayed under the threshold for 11 of the 13 weeks and my average so far is 2.27 hours of digital entertainment per week. I actually decided to adjust my 2 hours a week goal to be different for each quarter. Q1 was set at 3 hours per week, Q2 at 2 hour, Q3 will be way down at 1 hour and then back to 2 hours per week for Q4. The reason is seasonality – winter months bring more reason to be inside. This has come in the form of 4 movies, some time playing 2 different video games and a smattering of episodes from various Netflix shows. Right off the bat I noticed I had to change some habits to make this work. Airplanes used to be near-guaranteed screen time for me but lately I’ve had to find other things to do when in flight. Some flights I read, others I go through and organize things on my computer and once I actually spent most of the ride talking to a stranger. I’ve also been finding other ways to be entertained. So far I’ve read 2.25 books and played 26 boardgames this year both well above my pace from last year. Mandela wrote a pretty thick autobiography so I figured I would start there. I’m 25% of the way through it, which is a good bit farther than I usually am this time of year. I’ve gone so far as to buy a running vest, some trail shoes and a set of poles. The rest pretty much comes down to seeing how much my body can take. As a secret double-bucket-list I also signed up for a 150 mile bike ride around Mt. Rainier. I don’t plan to train for that much either. 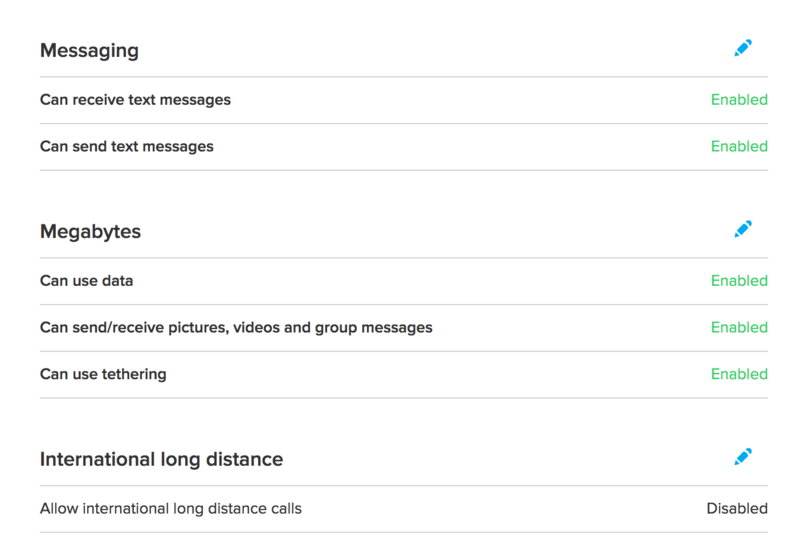 Ting Review (2019) – Five Years With Ting’s Cell Phone Service! It is now 2019 – I first signed up for Ting in March 2014 – that means I’ve been a happy Ting customer for over five years now! 5 years! During that time we’ve used the iPhone 5, iPhone 6, iPhone SE, iPhone 7 Plus and an Apple Watch. I thought I’d share a Ting review to shine more light on why I switched to them in the first place and why I’m still happy. I also have experience with Verizon and Google Fi, which I can compare the service to. I had long been a happy Verizon customer when in 2014 I opened a bill to find I owed over $200 for our three phones. That was above my limit of acceptability. I decided I needed to look for options. I looked at the plans of the major carriers – AT&T, Sprint, T-Mobile. I also came across a few alternative plans; Republic Wireless, Tracfone, Cricket, Virgin Mobile, Boost Mobile & Google Fi. As I began to look at those companies, I came up with a list of criteria that was important to me. I ultimately selected Ting, obviously. I’ve actually reevaluated every year since then and reselected Ting each time for these reasons. We’re iPhone folks and making a switch to another phone would be a difficult undertaking. I actually love Google products and my phone is mostly using the Google alternatives to Apple default software. The effort involved in retraining my wife & mom to use a new OS & phone made it hard for me to consider switching, and so compatibility with iPhone became a strong criteria. I did try to keep an open mind to other options, but it was going to take a lot to convince me to be on something other than iOS. On top of that, even if I went with Android, I would want a pure Android OS and not some reskin. I got burned pretty bad by Android fragmentation in the early days where my phone stopped getting text messages suddenly because of an unknown defect that lay between the OS, carrier and phone manufacturer’s reskin. A fix never came. A few of the companies I looked at ran a very custom version of Android and that made me very nervous – unless they had limited their supported phones dramatically, that would likely eventually result in me having a phone that didn’t work and an unplanned need for a new phone. Ting allowed the iPhone – back in 2014 when I signed up, you had to use the iPhone model that was one year old, but that is what I happened to be using at the time anyhow, so I was ok with that. Recently they’ve allowed the most recent version of the iPhone to be used – something I’ve taken advantage of by upgrading to the iPhone SE the day it came out. I legitimately might have been the first Ting customer to use the iPhone SE. In the many years I was a Verizon customer, I had very few dropped calls. Switching to something else seemed risky – I knew how miserable the lives of my AT&T subscriber friends were with all of their dropped call issues. I did a lot of research about service areas and congestion in my area before switching to Ting. At the time they only operated on Sprint towers but now you can select between Sprint & T-Mobile. I live in a major city where there is great coverage, so congestion tends to be the biggest concern, especially during peak times. After three years of using Ting I’ve noticed a downgrade in cell service quality from Verizon – but it still meets my bar of acceptability. I have had a few dropped calls & there are some places I’ve visited on vacation where I didn’t get great data service. But 99% of the time I am happy with the cellular signal. I’m ok with 99% of the results for ~50% of the cost. If you’re considering switching, the best thing to do is check the coverage (use this cool tool) around where you live and ask neighbors who use Sprint & T-Mobile how those services perform in your area. From my experience, neither is quite as good as Verizon but often that is fine because the cost savings are so great. I mentioned above that Ting uses other company’s towers which they essentially rent signal from. What Ting actually provides themselves is the account tools & customer support. Those are top notch and probably the biggest reason I picked Ting. Control the settings on devices. You don’t need to do this often, but it is nice to be able to control and check easily whenever you need it. Here is a screen you can use to see your usage during the month. Along with total usage in each of the three categories they charge for, you can see how much each person is using. 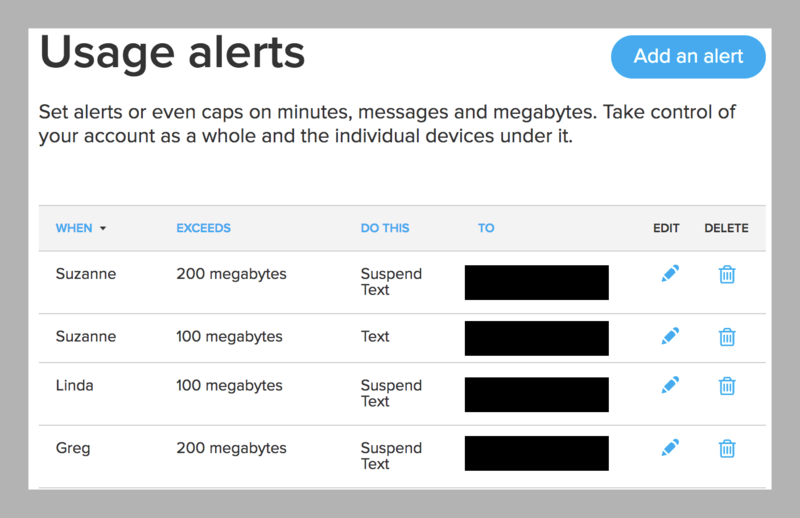 With this I can see that we are at 99 text messages so my next text message will actually kick us up a tier to the next payment level. With text messages that is only like $2 so it isn’t a huge deal. With minutes it can mean another $20, so it is great to have this info handy. Along with seeing our usage, I can set automatic alerts to help us stay within our budget. You can see below that I have it text reminders at certain limits and then actually turn off the data if you exceed another limit. It is easy to turn back on if we decide we’re ok going over, but having the limits in place helps make sure you don’t accidentally blow through data when you thought you were on wifi or something like that. The final part of the customer experience is Ting’s customer service which I would rate as world class. The few times I’ve had to call them for help with something, I’ve talked to someone that was friendly, helpful and empowered. They were able to solve my problem and one time even gave me a $10 credit as an apology. I’ve called in before on a weekend and actually talked to a human in the United States in less than 5 minutes – which is amazing. When I’ve emailed in there was great follow up thanks to their use of a ticketing system called Zendesk (which I also love). One caveat is they don’t have store locations all over like the major brands do. Some people like going into their local Verizon store and walking away with a phone & signed contract. I much prefer doing things on my time which often is not the same time a local store would be open. Doing things with Ting sometimes means waiting a few days for a new phone to come in the mail rather than having it in hand right away – but that isn’t a big negative to me – most of my shopping is online these days anyways and part of the reason Ting is less expensive is they don’t have to pay the overhead for all of those storefronts. Overall, I’m super happy with the customer experience with Ting – this is one area where they exceed the national providers. Ting makes it pretty easy to predict your price with this cool tool as long as you have some info about your average usage over the past months. Because of that, I knew what I was getting into and if you’re thinking of switching, you can too. What I wondered back then was if things would drift up over time. I pulled some data and it turns out that hasn’t really happened. In fact, I’m paying less today that I was when I switched over. I’m averaging about $85 a month for 3 iPhones – much less than the $200 I was paying to Verizon before I switched to Ting. Just to reiterate, I’m paying nearly 60% less than I was on Verizon for service I’m just as happy with. For the observant, there are two things you might also notice in the chart above. 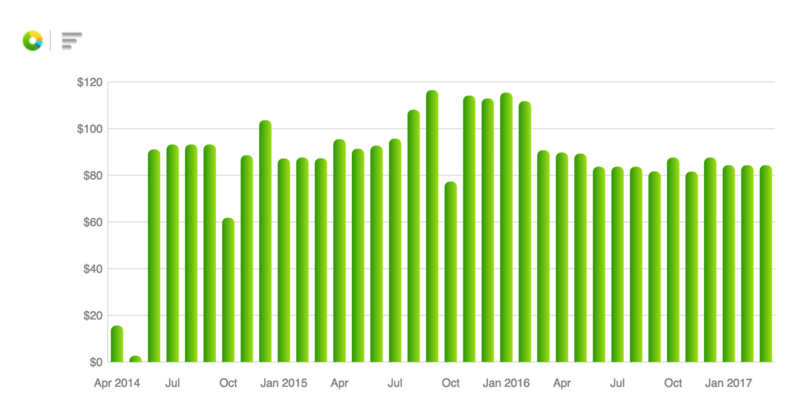 First, there was a time towards the end of 2015 where you can see our data usage drifted up a bit, as did our bill. We set up some better alerts (the ones I showed up above) and that helped us get things down lower than we originally were. Second, there are a few months that are a bit lower. When I first joined I got a credit for signing up and cancelling my old contract, so my first few months didn’t cost much. The few other random dips are because of credits I received, like the one I mentioned from customer support. I’ve kept abreast of other cell phone plans that have come out such as the recent T-Mobile unlimited plan and every time I run the math, I am still coming out on top with Ting price wise. For someone like our family that doesn’t use a ton of data, there doesn’t seem to be a better plan. 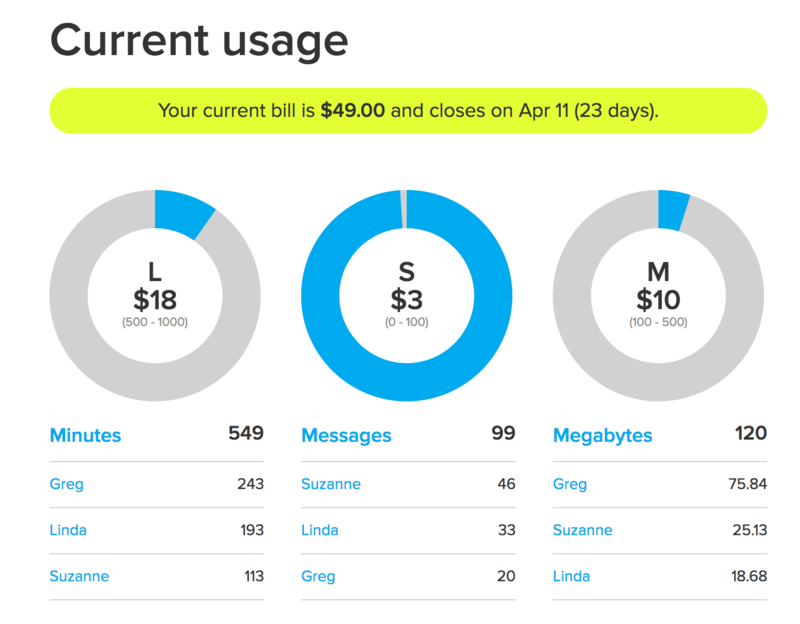 My favorite thing with Ting is that I have a ton of control over how I use my cellular devices, how much they cost me and how often I change things. I haven’t found many other options that give as much control. Not only am I not in a contract – which means I can cancel at any time, but I don’t even have a fixed amount I pay every month, it is based on what I use. So I know that I can use less and pay less, which is awesome control & flexibility that I’ve taken advantage of to save an additional 15%. I also have flexibility into what device I use and when I upgrade. With the major carriers you often get a discounted phone after two years, but really you’re just paying for that over time as part of your bill. With Ting we have full control of how often we switch. We’ve found that if you take good care of your phone, it can last longer than 2 years, which means a little more savings through a longer depreciation curve. On top of that, we also usually buy our iPhones used when a new model comes out so we often save even more. I’ve been very happy with Ting as have a few friends I’ve referred over. If you feel like you’re paying too much for your cell phone service or you aren’t happy with how they treat you, then I suggest you consider the other options that are out there. If you care about the things I mentioned – I hope this post helps with your evaluation. Hey! 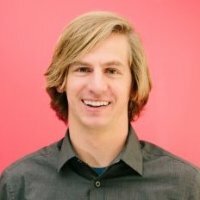 If you made it this far, you probably benefited from me sharing my experience. If so, I’d appreciate if you would click on the link below – it will save you $25 off of your first bill, and Ting will also knock a few dollars off my next bill to say thank you for helping you make a decision to switch. Posted on February 24, 2019 February 24, 2019 Categories Product Reviews11 Comments on Ting Review (2019) – Five Years With Ting’s Cell Phone Service! 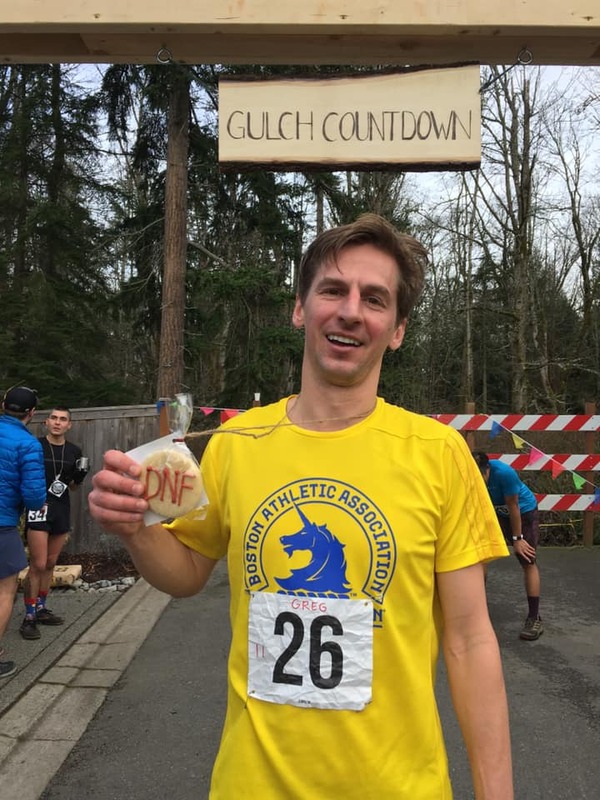 On Saturday January 5th, 2019 I did not finish the Gulch Countdown race, getting disqualified after ~27 miles. 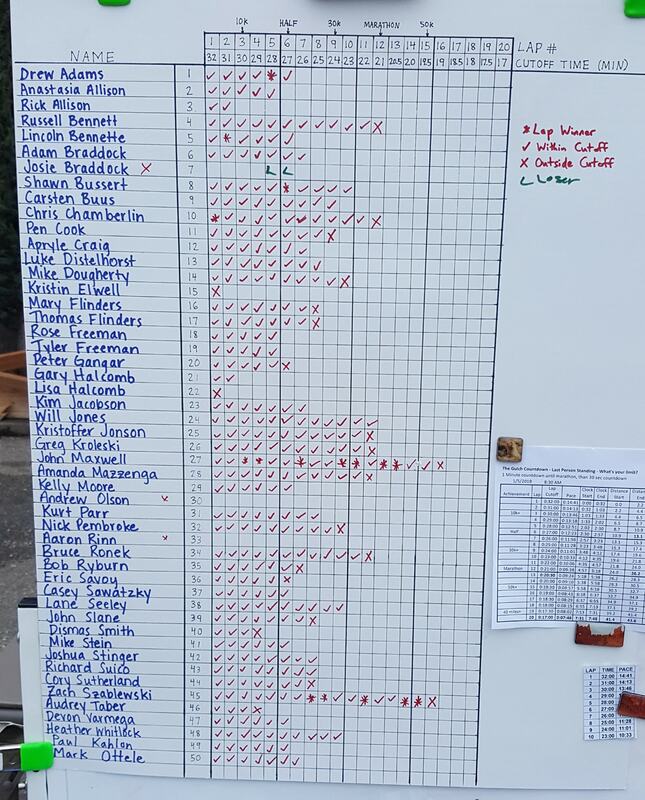 This is the race report. I really didn’t have goals for this race, I was just out there to have fun. 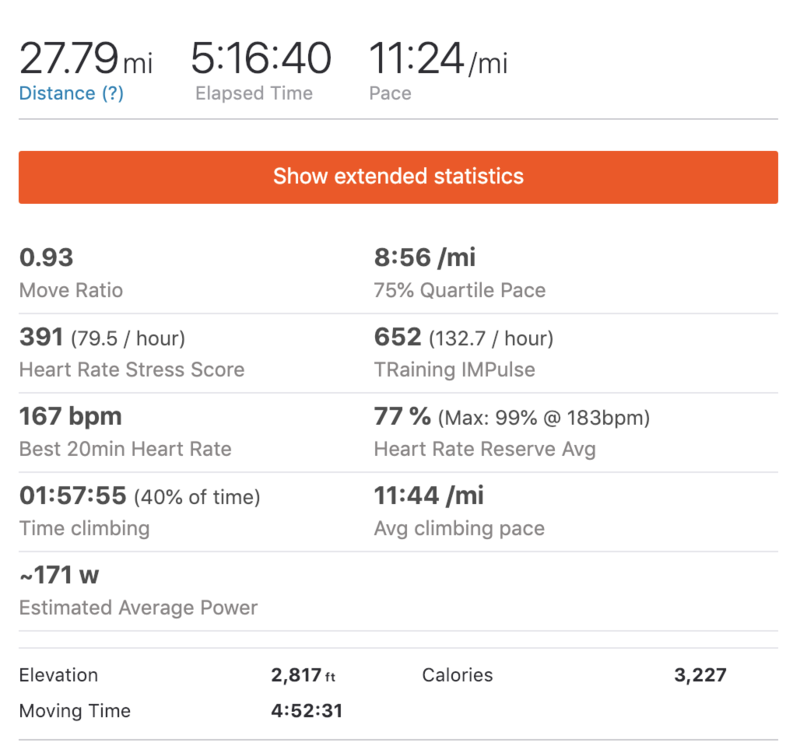 Part of me wanted to see how far I could run untrained though to see if it was going to be a good idea to attempt to go on a 93 mile run this summer. This race stands unique as being the longest race I have ever run, the first race (of hundreds) where I did not finish and also the race I was least trained for, ever. I loved every minute of it. 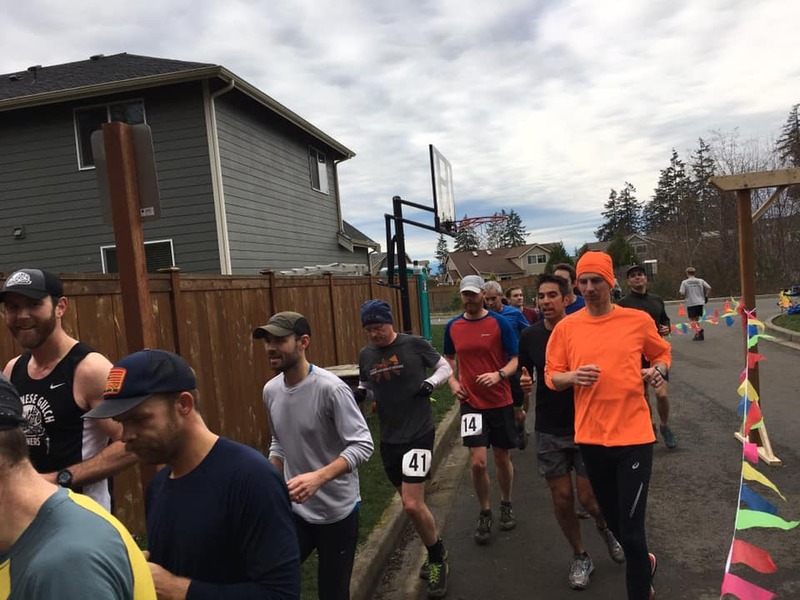 First, I should set context, the format of the race was unique – it consisted of 2.2 mile long laps on a muddy, hilly single-track trail that started at fixed times of decreasing duration. Anyone who finished the last lap before the cutoff was allowed to start the next one. Finishing a lap early just meant you had to wait around for the next one to start. The pace of the first lap was ~15 minute miles, by the time I got eliminated the pace was closer to 9 minute miles. Going into the race I had been running 4 miles once or twice a week, so I wasn’t sure how long I would last. I don’t think I’d cleared double-digits on an easy run in over six months. I had recently logged a few miles sub-six, so I knew speed wouldn’t be my limiting factor, it would be endurance – how long would I last before I simply ran out of energy. With that in mind, my strategy was to go as slow as possible and eat a lot early, so that I had every chance to still have glycogen reserves late in the day. I figured I could make it to 13 miles or so on guts and the slow pace cutoff. After that was a question mark. Going past 26.2 was a goal I had in mind as it would make this the longest I had ever run. 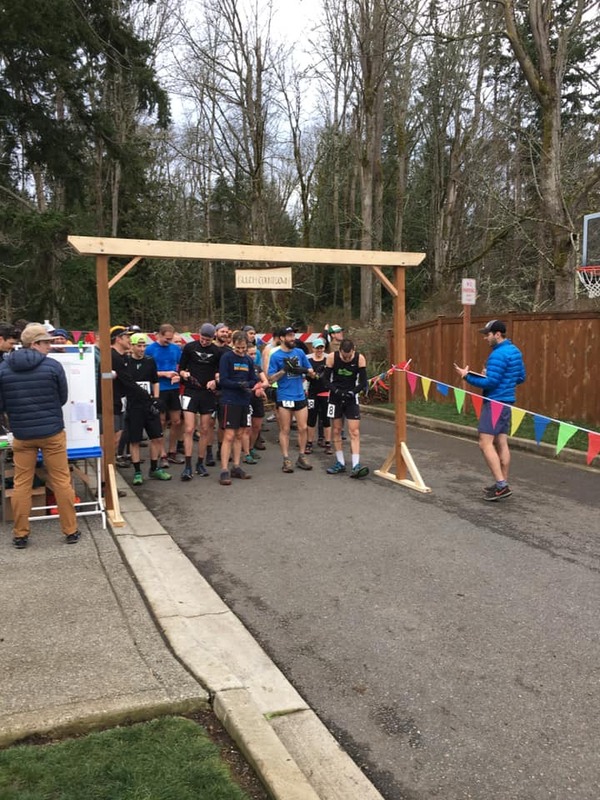 Because the race was a loop, and we had to wait after finishing a lap for the next one to start, having a self-provided aid station was perfectly possible. I had brought along a cooler full of clothing, food & gear to help me survive the day. Layers, braces, gels, and extra everything, just in case. In the end, it was a bit overkill. There were perfect racing conditions when the race started at 8:30am – 40 and cloudy. I started off in three layers of clothes – including a fleece jacket. I took off on the first lap in the very back of the 50 runners. In fact, my GPS was having trouble getting calibrated, so I walked across the start line 15 seconds after the gun went off. You can see me looking at my watch in the picture below. The first lap demonstrated one of the best aspects of this format. I had no motivation to run fast, so instead I ran with other people I might not normally have run with in a race. I spent most of that lap talking to my friend (and wife of the race director) Kristin. We were running slow enough that the main pack separated a bit and unfortunately, neither of us was paying attention to the course very well. During a place where the loop intersected itself, we accidentally doubled back on our tracks, putting us on a course to run an extra mile. We had been going pretty slow and so by the time I realized how far behind we were, there were only 10 minutes left to finish over a mile of the course. You can see me in the picture below way on the other side of the course from everyone else. I took off running and logged one of the fastest times of the day on the back half in order to finish just before the cutoff. I went from an easy 130 bmp to over 170 and was thoroughly sweating in my fleece jacket. Kristin didn’t survive the lap, but I think she only planned to run one lap anyhow. That first lap was a huge setback in terms of energy conservation. It would mean that I had not only run an extra mile compared to everyone else, but also that I had burned a lot of extra energy going top speed. After that first lap things returned to plan for the most part. The next 5 laps were basically a nice slow group run where I got a chance to talk with a bunch of different folks. 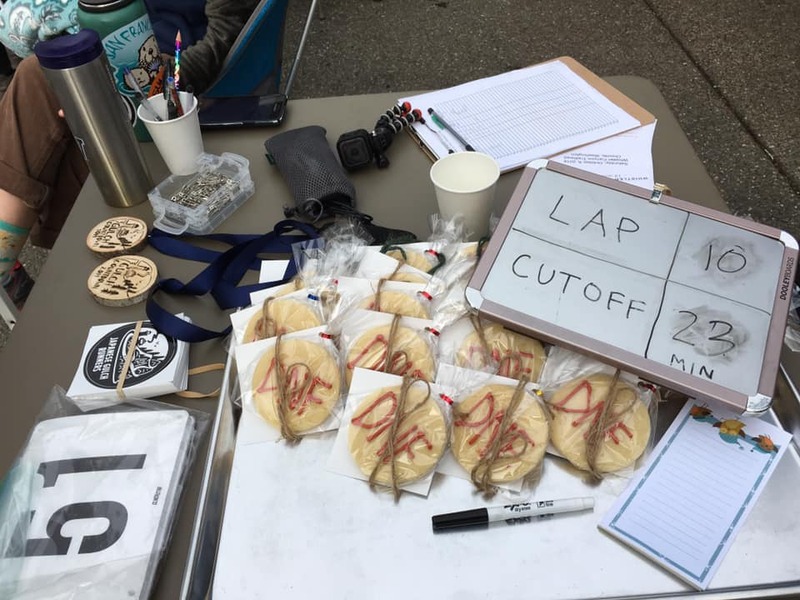 I slowly stripped off layers and ate food in the breaks between laps. I usually had 2-4 minutes to spare. I don’t think I ran two laps in the same outfit actually, I’d strip off a top one lap and a bottom the next – trying to keep as warm as possible without overheating. The end of lap 6 marked the half marathon was a marker in my mind at which point we’d start doing some real running. I planned a big reset and finished with a few extra minutes so that I could change socks, strip off my tights and hit the porta-potty. Once I was in shorts, it was time for business. Laps 7-9 felt like a real run. I noticed it got a lot quieter. 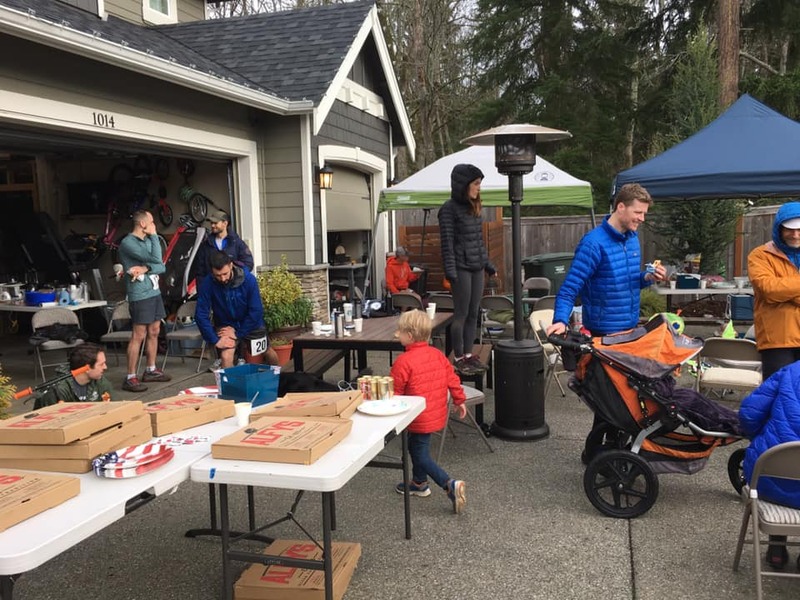 The number of people running had thinned a good bit and instead of rambunctious conversations on the trail, most of us were keeping pretty quiet. I started having less, if any, time between the laps and was more in need of support during those breaks. I took a bottle with me for one lap and probably should have had it with me for others. With all of the mud on the course, I wanted to keep my hands free though, in case I fell. It was about at this point that I noticed more people falling. Tired legs and a sloppy course that had been trampled 7+ times made it much easier to take a dive. It was lap 10 where my mind shifted from, ‘I can do this all day’, to “I’m not sure how many more of these I have in me”. The cutoff time had now dropped from 32 minutes to 23 minutes, and we now all had 22 miles under our legs, meaning we were past the point of a run when people usually hit the wall. 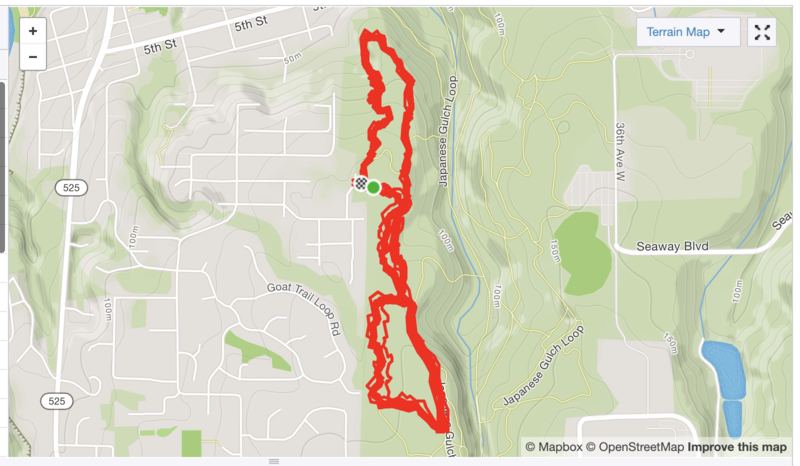 I made notes of a few milestones on the course to see how long it took me to get between them. I figured it would be good to know how close I was to finishing one of the coming laps on time. Lap 10 took a good bit of work. Lap 11 was my fastest of the day. The group was getting thin and I was starting to hurt. 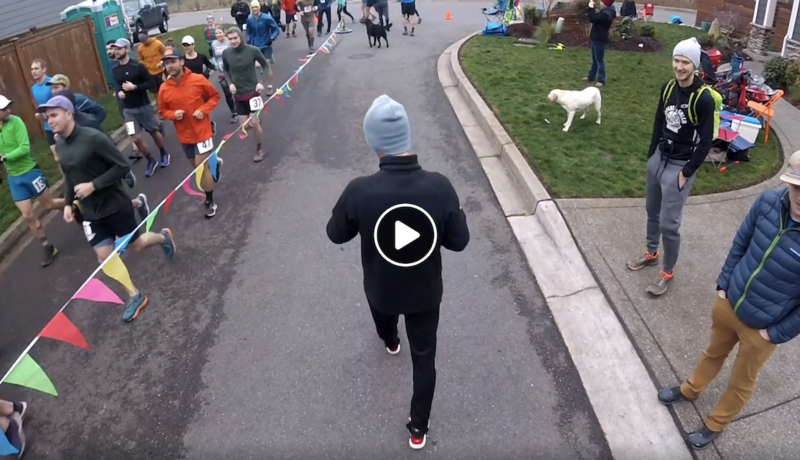 I locked behind another runner and held on for dear life. We kept hitting the milestones on the course perfectly, so I just hung on. It felt like real work. We pushed the flats and downhills and power hiked the uphills. We finished with maybe 20 seconds to spare and the next lap would have a cutoff one minute faster, meaning we needed to run 40 seconds faster to finish on time. Once I cleared lap 11, I knew my total would be at least 27 miles, even if I walked that last lap. Only 9 of us started that lap. I doubted I could finish on time, but there was no harm in trying. I thought I might be able to do it if I found the right runners to hold on to. After-all, I only had to go 40 seconds faster than my previous lap. I started off hanging onto the main group at all costs. Surprisingly I crossed my 9:00 checkpoint on time. Just 12 minutes more and I would finish. As I hit the long steady uphill section, things started to fall apart. I let a runner in front of me go, and that ended up being a critical mistake. I caught another runner, but he was limping along and in no place to push the pace. I pushed him to dig deep and then took off, hoping to beat the clock. At the mark where I knew I could finish in 6 minutes, I checked my watch and only had 5 minutes left. This was going to be an all out sprint. I cleared the 3 minute marker with 2:40 left, I was making progress, but not enough. The cutoff whistle blew with me in eyeshot of the finish, I was probably 30 seconds away. I walked it in and crossed the line a few minutes later. I didn’t finish that lap within the time, so I was eliminated from participating in the next one. It turns out only 2 runners went on to run lap 13 and they both ran another 10 miles before hitting a lap that neither of them could make the time cutoff for. 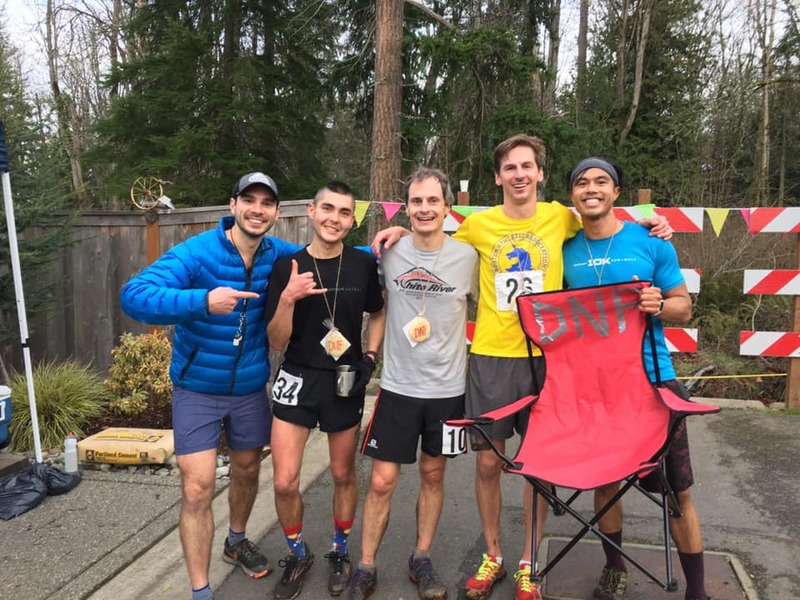 Both of them could clearly put in the distance, the guy that won finished 19th in the Western States 100 last year, but the pace eventually got too fast for the trail. So even if I had finished, I would definitely have ended up in 3rd place and likely only finished one other lap before getting cutoff. My plan was actually to walk the next lap with some pizza and relax, but alas I was 30 seconds too slow. Here is the race organizer, Abram, on the left with a few of us that DNFd on lap 12. First, here are some overall stats to set context for the day. 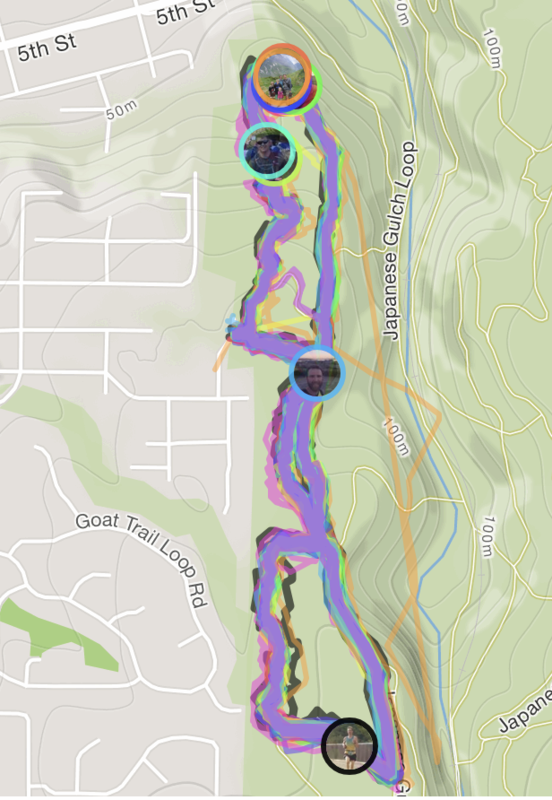 My GPS logged me at 27.79 miles and 2,817ft of climbing at an average pace of 11:24. Interestingly, I spent 40% of the day climbing. Of the 5.25 hours I was moving for 4.75 hours, so I had a total of about 30 minutes of downtime. 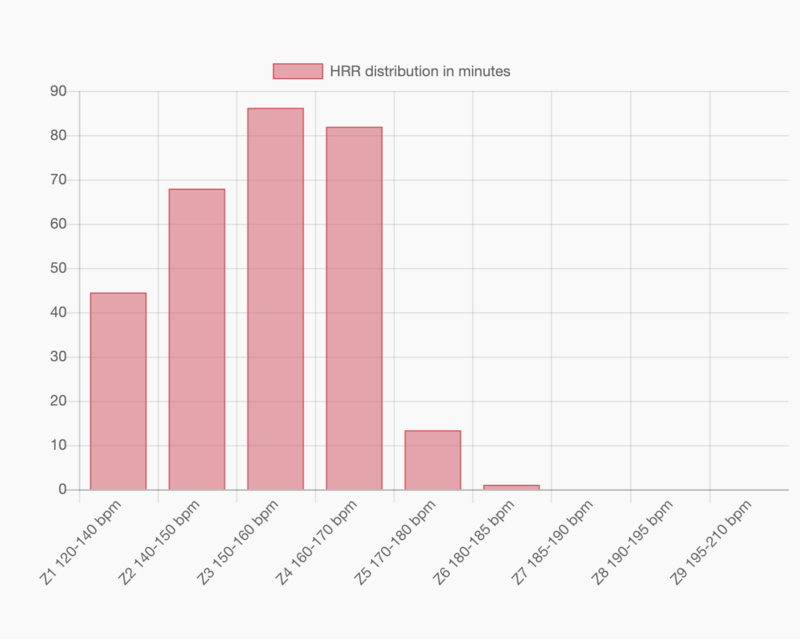 It wasn’t until after the first lap that I realized I should turn off auto-lap on my watch so that I could see the cumulative time for each lap and better measure out my progress over the day. The times below are a bit wonky because some laps include the rest time at either end of them while others include none. The heart rate charts shows how well I executed my planned strategy of saving energy till the end. 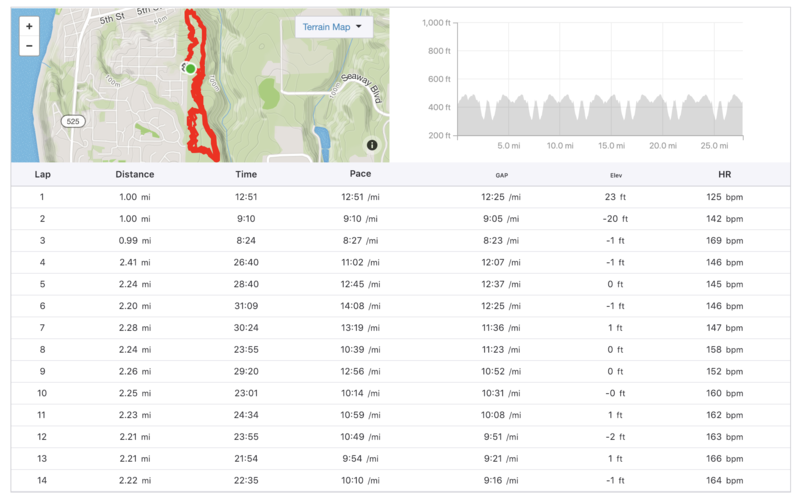 Other than miles 2-3 where I had to sprint and maxed out my heart rate, I kept it pretty conservative, even up the big hills. My last lap was my hardest effort of the day, which is all you can ask for. Despite putting in a lot of work, my heart rate primarily stayed in zones 2-4, with a good bit of time in zone 1. For reference, in a marathon, I would primarily be in zone 4 and anything shorter than an hour would be almost exclusively in zones 5 & 6. I’m hoping Abram will run this race again and that maybe I can put a tiny bit more training into it before next time so that I can get closer to 50k. I actually think with my speed that if the race finished around 35 miles again next time, I’d have a decent shot at winning it. Unlike a 100 mile race where I needed to have crazy endurance, this race favors being well balanced. As a result of this race, running nearly 30 miles off of almost no training, I’ve decided to try and push what I can accomplish without training. I don’t have much time to train these days but that doesn’t mean I can’t have fun. This summer I plan to try and tackle the 93 mile Wonderland Trail off of about this much of a base. I suspect that run would be challenging no matter how much I prepared, so I might as well save some time in the process. Wish me luck.